Hip pain and injury might not be as common in golf as injuries to the shoulder, back and wrists, but the swing can still take its toll on the hips, especially if they lack conditioning and/or technique is flawed. The hip is a ball and socket joint with a very large range of motion. 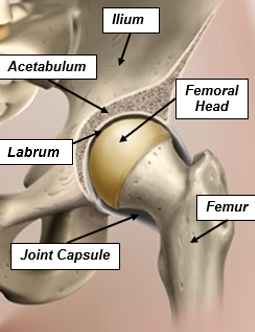 The rounded top of the femur (femoral head) slots into a round socket in the pelvis called the acetabulum. The acetabulum has a ringed shaped lip called the labrum, a form of cartilage, which helps to keep the hip joint stable. Golf requires lots of flexing and twisting, which puts a great deal of pressure on the hips. If you have restricted movement in the hip, the vigorous movement of the golf swing will stretch the ligaments that surround it and hold it together, which will cause pain. If the joint capsule gets buckled or the joint catches against it during movement, hip impingement occurs and that too will be a source of pain. Worse still, the labrum can become torn either through overuse, or more likely if excessive force is exerted on the hips during the swing as a result of poor technique. Damage to the labrum decreases the stability of the femur in the hip joint and fluid may leak from the joint, causing friction in the hip. A sharp pain will be felt as soon as the injury is sustained and will be worse when bearing weight on the hips, especially while flexing or rotating them. Your lower body has to provide stability, not just rotation. It is therefore important that the muscles surrounding the hip joint have an adequate combination of endurance strength, motor strength and range of motion. If you suffer from a sway or slide in your golf swing, there’s a very good chance that you have restricted internal hip rotation. If so, not only will you lose distance, but it can also cause hip pain, lower back pain, knee and ankle problems. The hip joint in the lead side has to withstand significant rotational forces while bearing the majority of your body weight, which makes it vulnerable to injury and it’s important to get stacked over that lead hip with neutral joint alignment through impact. 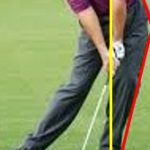 Equally, if you spin the hips and get too open at impact, then your joint alignment is also out of sync and that is going to put a lot of extra unwanted stress on the body. Your lead hip will not be lined up over your lead knee and ankle, and you'll risk injury. You can tear your labrum, or do any number of other things to your hip that can cause discomfort and, eventually, pain or injury. 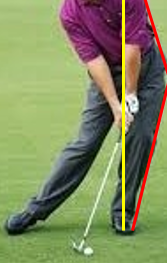 Spinning the hips also tends to result in excessive secondary axis tilt with the hips getting way ahead of the upper body. In turn, that is a recipe for coming too far from the inside and leads to a lot of thin shots especially with fairway woods and the longer irons. 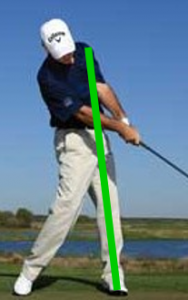 The legs and hips are too powerful and the upper body can't keep up, so the golfer gets hung back, or ‘trapped’, and hits a lot of blocked shots. You need a proper weight shift to get that lead hip all the way into neutral, where it's designed to be, if you are to pivot safely and efficiently. Then you can get posted up on that lead side and, with your lead glute fully contracted, stabilize the hips, rather than spin them. If you lean back too far, your lead armpit will be way behind the ball and your swing arc will bottom out too early, making it almost impossible to compress the ball properly. The lead hip is exposed to high-velocity internal rotation on the downswing, requiring a great deal of gluteal strength (the buttock muscles). If you are looking for more power and to avoid future injury you need to strengthen the muscles around your hips and improve your hip rotation. In summary, if your hip/pelvic girdle complex is to provide both the stability and rotation demanded by the golf swing, it is crucially important that the relevant muscles have an adequate combination of endurance strength, motor strength and range of motion. Golfers need to ensure that is the case by undertaking a screening assessment [See: https://fittergolfers.com/free-videos/self-assesment/] and if necessary conditioning the muscles to rectify any shortfall.Warming up before teeing off and warming down properly will always help to protect you against injury and it is also essential to get adequate rest between rounds, as fatigued muscles and joints are more prone to injury. 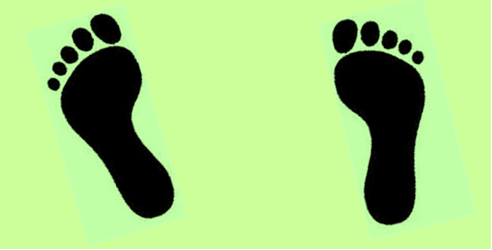 If you have flat feet, wearing insoles that support the arches of your feet while playing will help to correct your posture and take the strain of your hips, but if you rely on these, the muscles will, over time, weaker further, so ideally you should do conditioning exercises to strengthen the muscles that support the medial arch. Finally, as always, correct technique is important and will help to reduce the amount of stress on the hips.